- This mission will pop up immediately after completing your tour of the Prydwen. 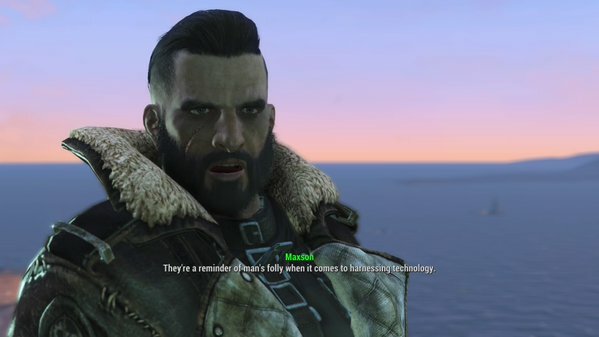 Once it’s done, speak to Elder Maxson. He’s standing at the rear of the Prydwen, staring down at Fort Strong, and after he’s described your task - kill the Super Mutants in Fort Strong - he’ll tell you to get on a Vertibird. - Here comes the annoying part of this task. The quest marker will point you to the Vertibird attached to the Prydwen - but when you get on it takes you down to Boston Airport. You’ll wind up going back and forth, and be really confused in the doing. In truth, the Vertibird you need to hop in is outside the Airport, near a gunnery range. Go down the main hall from the primary landing spot, then take a right, then another right. - If you want some extra stuff, bring Danse along for this mission. He provides some flavour to the proceedings. Your task in this mission is to take down the Super Mutant Behemoth, an enormous Super Mutant that stands in the midst of Fort Strong. The Behemoth isn’t that tough - all it does is hurl rocks at your Vertibird and take a lot of damage. The problem here is the other Super Mutants, as they’ll constantly harangue your ride with gunfire. You won’t personally take damage, but if the Vertibird absorbs enough abuse it will crash and take you with it. You should ideally focus most of the abuse on the Behemoth, but if you see other Super Mutants milling about on the ground, shoot them. This will have the dual effect of protecting the Vertibird and making what comes next easier. If the Vertibird goes down and you do not die - which, trust me, is possible, as it happened to me - you’ll have to finish this battle on foot. 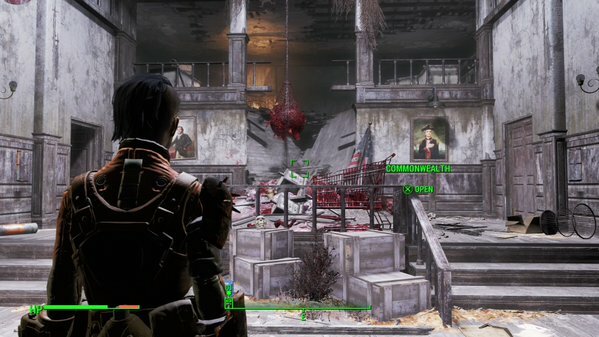 You’ll have to kill the rest of the Super Mutants on the ground anyway if the Vertibird does make it, but it’s entirely possible that you’ll wind up fighting the Behemoth with a gun. It can be done, but it’s much tougher, and you’ll want cover immediately. Having Danse in his Power Armor can really help even the odds. If you still have the Vertibird, consider staying behind the minigun and picking off the Super Mutants from there - they will happily come to greet you. The foyer of the Fort Strong Armory in Fallout 4. The loot of the Super Mutants in ammo alone is worth grabbing, especially if any of them turned out to be Legendary. The Behemoth itself has lots of ammo. Wander across the bridge from Fort Strong and you’ll find a thin series of sandbars leading north, to Nordhagen Beach. Along the way is a small building, inside which you’ll find some Power Armor. Yep, gotta clean this place out too. The Armory is not particularly large, and when you enter you’ll wind up in a foyer with doors on either side, the right one locked. Both - particularly the right - lead to brutal shootouts with Super Mutants, and since they’re generally watching the doors it’s really hard to sneak around. Alerting even one will bring all of them down on you. The easiest way to deal with these brutes is to pop one of the doors open, kill the ones inside (a grenade works really well in these tight quarters), then pull back into the room and kill the Super Mutants emerging from the opposite door. Brutal, and not sneaky at all, but the Brotherhood ain’t exactly sneaky dudes. There’s a technical Document in the desk that’s squashed into blood and guts at the front of the Armory. Look for the Meat Bag dangling over it. Through the right door you’ll find another locked room. Inside is a terminal with information on Fort Strong, a trunk full of ammo, a Master floor safe with more ammo inside, a Mini Nuke in a busted display case, and, sitting on the desk, a U.S. Covert Operations Manual. There’s also the Fort Strong Key inside the desk. The rest of the rooms on the ground floor contain a general assortment of useful items and / or junk. You can find more of the same if you bother to get up to the second floor, accessible via a series of tricky jumps through a busted ceiling in what looks to be a meeting room in the south wing. In the connecting hallway between the two wings you’ll find an elevator. Take it down and you’ll find another floor of Super Mutants, patrolling among a series of connected offices. It’s much easier to sneak around here, and you can get into a loud gunfight if you want (though be careful of one with a Missile Launcher). Nothing too heavy overall. Clear ‘em all out to complete your mission. Before leaving, check the north of the sublevel. There are some more Mini Nukes sitting on a table near a case of unassembled bombs, and if you check a side office you’ll find a terminal with details on the Fat Man, one of the worst ideas in modern fictional warfare. - Talk to Danse if he’s with you, or, if he’s not, head back to the elevator. He’ll be waiting. You can speak to him about his exquisite hatred of Super Mutants and learn about his past if you’re persuasive enough. That done, return to the surface, go back to the Prydwen, and speak to Maxsom to complete the mission. He’ll give you some Vertibird Signal Grenades as a thank-you; you can use these to summon a Vertibird to your location and give you a lift elsewhere.